On February 15, 1933, President-elect Franklin D. Roosevelt attended a reception at Bayfront Park in Miami, Florida. After addressing a crowd of supporters from atop the back seat of an open car, Roosevelt slid back down his seat. An unemployed bricklayer named Guiseppe Zangara had fired five bullets at FDR from close range. Though a bystander deflected his hand, Zangara wounded four people and fatally shot Chicago Mayor Anton Cermak, who was standing beside Roosevelt’s car. One of the wounded was William Sinnott, a detective who had frequently acted as Roosevelt’s bodyguard in New York City. Sinnott had just moved to Miami earlier that week when he was called to assist FDR’s security staff. The bullet fragment pictured above was removed from Mr. Sinnott’s wounded head. Ten other fragments from the bullet that struck him remained in his body. When visiting Sinnott in the hospital, FDR said, “You couldn’t hurt him, bullets just bounced off his skull.” Mr. Sinnott was awarded the Congressional Gold Medal in 1940 in recognition of his service that day. 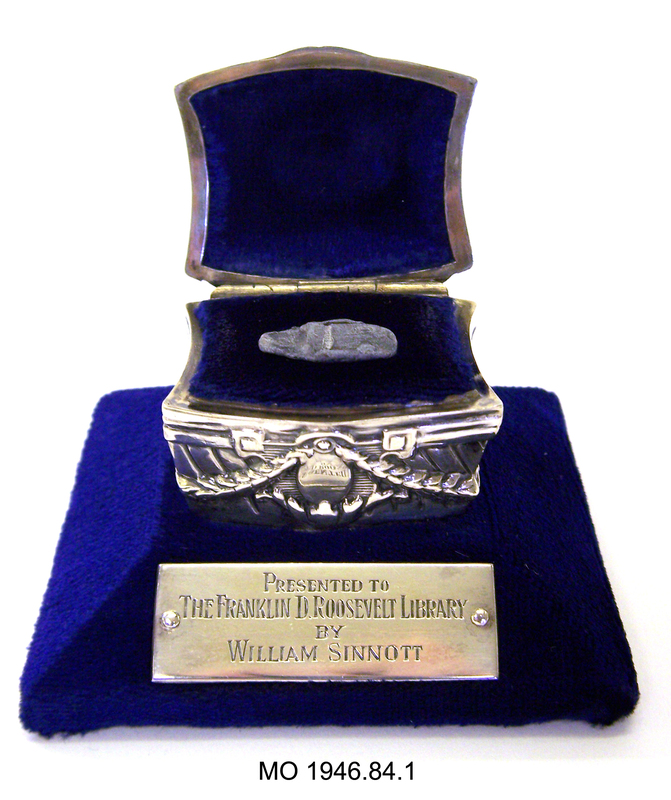 In 1946, Mr. and Mrs. Sinnott donated the bullet fragment in this specially designed presentation case made by Lambert Brothers Jewelers to the FDR Library.